If there is a single movement ubiquitous in modestly-priced contemporary chronographs, it is the Valjoux 7750. Introduced in 1974–five years after the famed Zenith El Primero automatic–the movement has been supplied in both 21,600 and 28,800 beat versions. 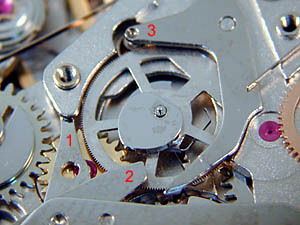 It uses an automatic-winding module attached to the top of the movement, winding in one direction by means of a single double-click wheel. Initially using 17 jewels, current versions run in 25. The 7750 is 13.25 ligne (30 millimeter) design, 7.9 millimeters thick. Like many contemporary chronographs, the Valjoux 7750 dispenses with the traditional column wheel for switching functions. 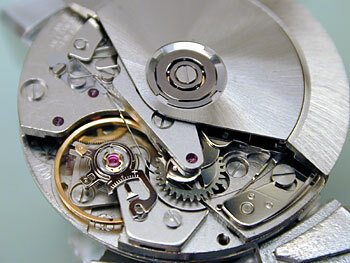 Instead a heart piece limiter (left) is used to coordinate starting, stopping, braking, and reset functions, usually by means of two buttons in contemporary designs (the earliest coulisse-lever calibers used three buttons). The Valjoux 7750 also utilizes a concept first patented in 1941 by a watchmaker, Henri Jacot-Guyot. This is a reset-to-zero (or heart piece) lever which pivots to reassure accurate reset-to-zero of both the center hand and minute counter. Previous coulisse lever designs had not been as precise in this regard. While the parts count of a coulisse-lever design is comparable to that of a column wheel design, the various levers and springs in the lever design require much less precision in form and materials and are much less expensive to manufacture. This–economy of manufacture–was and is the purpose of a coulisse lever caliber. 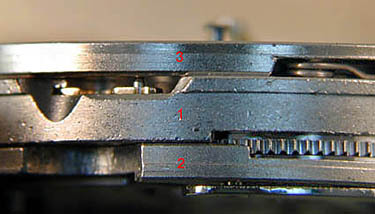 For ease of manufacture and service (right), the Valjoux 7750 is constructed of a mainplate (1), a calendar plate (2), and a chronograph top plate (3). 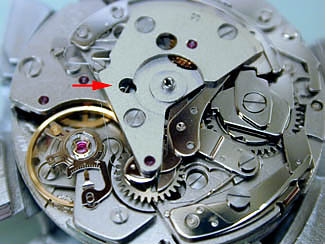 An additional bridge for the automatic winding system is attached to the chronograph plate on the top (watch back) of the movement. With the automatic winding bridge removed, the full chronograph plate is visible (left). 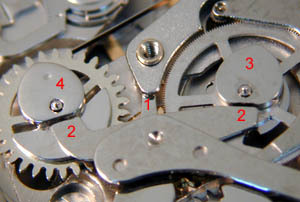 Parts include (1) the heart piece limiter; (2) the center wheel with heart piece; (3) the minute accumulator with heart piece; (4) the Jacot-Guyot pivoting heart piece lever with self-adjusting hammers (5); the tilting pinion arm (6). The heart piece is acted upon by one of the two case pushers and rotates back and forth (unlike a column wheel, which rotates continuously in one direction). 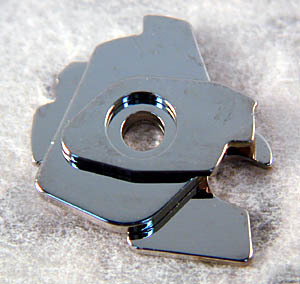 As shown right, the heart piece is in the zero-reset position. In this position of the heart piece, the center wheel brake (1) is clear of the center wheel (to allow reset to zero). The hammers of the heart piece lever (2) rest on the flats of the heart cams for the center (3) and minute accumulator (4), holding them at zero. 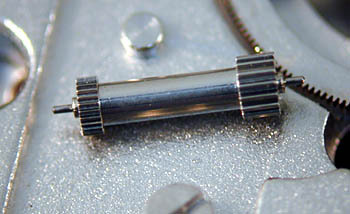 The tilting pinion drive is disengaged from the center wheel (below right). 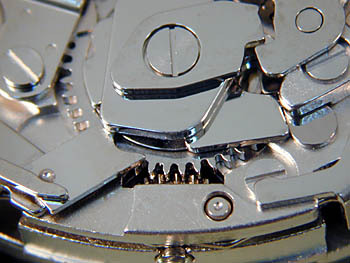 The heart piece is next rotated clockwise by the upper case pusher to start the chronograph (right). 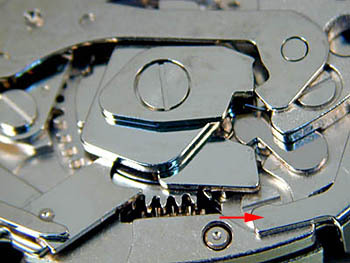 The case pusher is indicated at the arrow. In this position of the heart piece, it can be seen (right) that both the center wheel brake (1) and reset hammer (2) are clear of the center wheel. 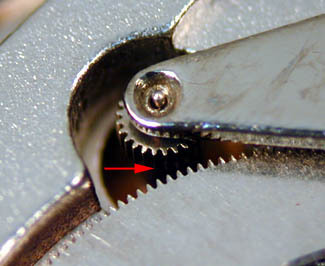 The tilting pinion is engaged with center wheel (3). 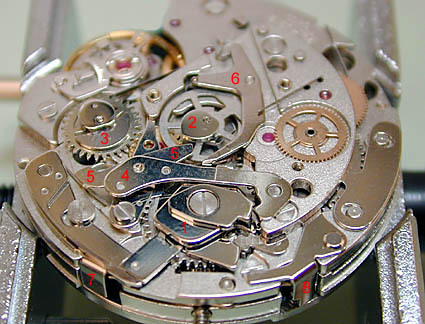 Finally, the heart piece is rotated counterclockwise by the lower pusher (arrow, right) to stop the chronograph. 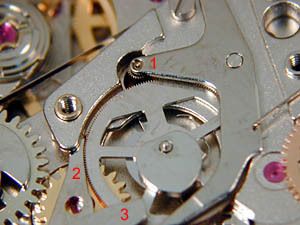 As illustrated right, the pinion drive (1) is disengaged from the center wheel, the brake (2) is applied to the center wheel, and the reset hammer (3) is disengaged from the heart cam. Typically the operation of a coluisse-lever design with heart piece limiter will not be as smooth as that of a column wheel, and pusher forces between various functions will vary. Coordination of functions with a modern design like that of the 7750 will typically be good, though imprecision of hand start, stop, and reset may be greater than that of good column wheel designs. CONTINUE TO PART 2 OF THE ARTICLE.